This year Redis continues to rack up milestones. A few days ago we celebrated the 10th anniversary of Salvatore Sanfilippo first posting a link on Hacker News about starting the Redis project. Now coming fresh off our fifth annual – and biggest ever RedisConf – we are thrilled to receive the news that Redis has been named the most loved database in Stack Overflow’s 2019 Developer Survey for the third consecutive year! In this year’s survey, Redis significantly increased its share of developers as the database they want to continue working with, up nearly seven percent to 71.3% of the total respondents. 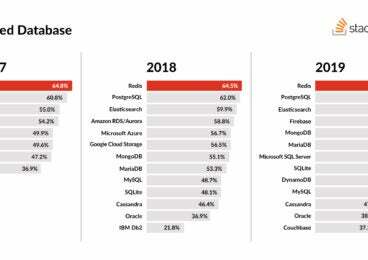 Redis continues to be the sixth most commonly used database and the fourth most wanted database. This year Stack Overflow received nearly 89,000 responses from developers in 179 countries. In combination with more than 1.5 billion launches on Docker Hub, it is exciting to see Redis continue to gain widespread love and adoption by developers worldwide. If you are interested in learning more about Redis and experience the performance and simplicity that Redis is most loved for, you can sign up and get 30mb of Redis for free in the cloud. It’s yours as long as you use it – no strings attached. Thank you again to the entire Redis community for your tremendous support and can’t wait for what else is in store for the rest of 2019.